Jim Grant of Grant's Interest Rate Observer breaks down the classical gold standard that eventually choked governments because of its rigid standards. He goes on to say that you just simply could not devalue your way out. 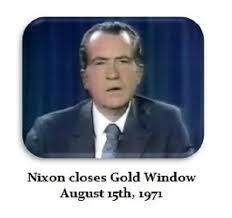 So on a Sunday evening, Aug. 15, 1971, President Nixon announced the temporary suspension of the dollar’s convertibility into gold which ended up being a lie and stayed indefinite.